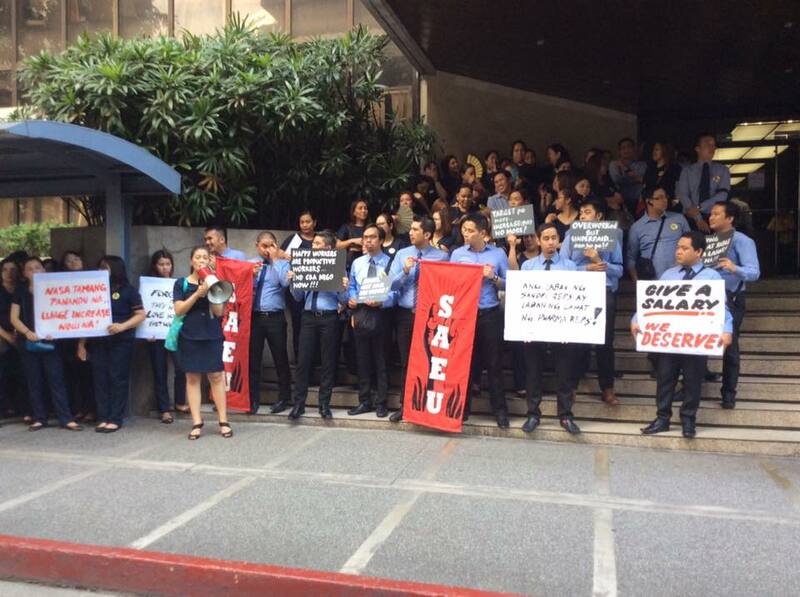 Scores of med reps of the big pharmaceutical firm Sanofi-Aventis held a protest this morning to call on management to accede to workers’ demands for a wage increase and end the collective bargaining negotiations deadlock. Since October last year, bargaining talks have been deadlocked over ten items from salary hike to hospitalization plan. Last Friday, the notice of strike filed by the med reps union matured and a strike can be launched any day according to law. In the noisy but peaceful protest by SAEU, several members spoke in turn about the challenges of achieving sales quotas and the stress of meeting productivity demands by management. They also held a noise barrage using whistles to symbolize their hope that management will hear their just demands. “A good collective bargaining agreement that provides for a living wage and decent benefits is the Rx for the productive and demanding work that med reps deliver. Sanofi-Aventis is a very profitable company that can afford to be generous to its employees. We remind management that happy workers are productive workers,” insisted Joseph Corpuz, a SAEU officer. SAEU members in cities of Angeles, Cebu, Iloilo, Bacolod and Davao also held protests at the regional officers of the Department of Labor and Employment. The mass actions today is the start of daily actions to push for the resolution of the CBA deadlock. SAEU represents some 200 med reps working for the company over the whole country. Sanofi-Aventis is among the biggest pharmaceutical companies in the Philippines and is fourth largest in the world in terms of sales. Sanofi-Aventis (Philippines) Inc. is the subsidiary of the multinational firm Sanofi based in France.